Georg Wilhelm Friedrich Hegel (August 27, 1770 – November 14, 1831) was a German philosopher, the main representative of nineteenth century German Idealism, and one of the major thinkers in the history of Western philosophy. Building on the foundation laid by Johann Gottlieb Fichte and Friedrich Wilhelm Schelling, Hegel developed a speculative system practically unrivaled in the scope of its ambition. Hegel’s highly systematic philosophy has been characterized as a form of panlogism. A system which portrays rational thought as the ultimate reality as well as the instrument to explain all reality. In that system, the Absolute, considered by Schelling to be beyond the grasp of reason, is described in its development as Spirit through a dialectical process, an idea that would later be borrowed by Karl Marx. Hegel described his method as speculative, in the sense that it unveiled the hidden dimensions of reality through an analysis of the thought process of the dialectic. Being and non-being, for instance, are usually considered opposites that destroy each other. For Hegel, their mutual negation leads to the third element of a triad, in which both earlier elements are sublated, absent as such, yet included in a higher form. This formula was applied by Hegel to all aspects of thought and nature, leading to a comprehensive system where the Absolute’s development is explained through its own internal mechanism. The fascination exerted by Hegel’s system rests on its ability to explain existing contradictions and how they are transcended without resorting to an external explanation. His apparent ability to produce a "theory of everything" was based on the simple laws of thought considered in an unexpected new light. His philosophy has often been considered through simplified caricatures, rather than for what it really is. The often-heard criticism that, in his logical deductions, he used sophistry covered up by obscure language cannot be ignored. The very mechanism of his dialectical movement has often been questioned, and the results of his speculation can appear far removed from reality. Hegel’s intention was to show how contradiction is solved on increasingly higher levels of development. He in fact introduced conflict into the idea of the Absolute. As with the other German Idealists, the nature of the Absolute, which he often called God is largely unclear. In particular, Hegel's teachings blur the dividing line between the notion of a transcendent God and the immanent absolute of pantheism. Hegel's system, in spite of its fascinating character, split within his own school into Right and Left Hegelianism. It faced two different particular reactions against it: Soren Kierkegaard's God-centered existentialism and Ludwig Feuerbach's atheistic anthropology. Hegel was born in Stuttgart, Württemberg, in present-day southwest Germany, on August 27, 1770. As a child he was a voracious reader. In part, Hegel's literate childhood can be attributed to his uncharacteristically progressive mother who actively nurtured her children's intellectual development. The Hegels were a well-established middle class family in Stuttgart—his father was a civil servant in the administrative government of Württemberg. Hegel was a sickly child and almost died of illness before he was six. Hegel attended the seminary at Tübingen with the poet Friedrich Hölderlin and the objective idealist Friedrich Schelling. In their shared dislike for what was regarded as the restrictive environment of the Tübingen seminary, the three became close friends and mutually influenced each other's ideas. The three watched the unfolding of the French Revolution and immersed themselves in the emerging criticism of the idealist philosophy of Immanuel Kant. Hegel also became fascinated by the works of Baruch Spinoza and Jean-Jacques Rousseau. 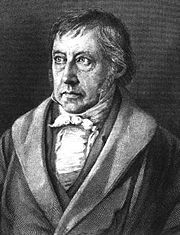 After graduating in 1793, Hegel worked as a tutor in Bern, Switzerland, and later in Frankfurt. During that period, he completed his first work, which was in theology and was only published in 1907 as Hegel’s early theological writings. In 1801, Hegel became a professor at the University of Jena, the cultural center of that time, and he soon began to collaborate with Schelling in editing the Critical Journal of Philosophy. In 1807, his first main work, Phenomenology of Spirit was published. Due to the political turmoil of the time, Hegel was soon forced to leave for Nürnberg, where he served as the principal of a high school. During that period, he quietly continued his philosophical work and published the Science of Logic. After a brief interlude teaching at the University of Erlangen, Hegel held the chair of philosophy at the University of Berlin until his death from cholera in 1831. There, he acquired a position of quasi absolute authority in the field, a position that was not to last. The very element in his philosophy that fascinated his listeners was soon perceived as unorthodox and by the time of his death the establishment was ready for change. Unlike his younger friend Schelling, Hegel was rather uncharismatic and unremarkable in his early development. It would take some time for his systematic thought to take shape. Once that was the case, however, Hegel’s philosophy easily outshone all of its rivals, at least for a limited period of time, and it would remain as a key landmark in the history of philosophy. Apart from minor publications, Hegel published only four books in his life: the Phenomenology of Spirit (or Phenomenology of Mind), his account of the evolution of consciousness from sense-perception to absolute knowledge, published in 1807; the Science of Logic, the logical and metaphysical core of his philosophy, in three volumes, published in 1812, 1813, and 1816; Encyclopedia of the Philosophical Sciences, a summary of his entire philosophical system, which was originally published in 1816 and revised in 1827 and 1830; and the (Elements of the) Philosophy of Right, his political philosophy, published in 1822. He also published some articles early in his career and during his Berlin period. A number of other works on the philosophy of history, religion, aesthetics, and the history of philosophy were compiled from the lecture notes of his students and published posthumously. Modern philosophy, culture, and society seemed to Hegel fraught with contradictions and tensions, such as those between the subject and object of knowledge, mind and nature, self and other, freedom and authority, knowledge and faith, the Enlightenment and Romanticism. Hegel's main philosophical project was to take these contradictions and tensions and interpret them as part of a comprehensive, evolving, rational unity that, in different contexts, he called "the absolute idea" or "absolute knowledge." According to Hegel, the main characteristic of this unity was that it evolved through and manifested itself in contradiction and negation. Contradiction and negation have a dynamic quality that at every point in each domain of reality—consciousness, history, philosophy, art, nature, society—lead to further development until a rational unity is reached that preserves the contradictions as phases and sub-parts of a larger, evolutionary whole. This whole is mental because it is mind that can comprehend all of these phases and sub-parts as steps in its own process of comprehension. It is rational because the same, underlying, logical, developmental order underlies every domain of reality and is the order of rational thought. It is not a thing or being that lies outside of other existing things or minds. Rather, it comes to completion only in the philosophical comprehension of individual existing human minds that, through their own understanding, bring this developmental process to an understanding of itself. Hegel’s early writings are significant in two ways: they already show his concern with the theme of alienation and they also show his theological orientation, an orientation which subsequently took on a philosophical form but as such remained to the end. In his earliest work, Hegel notes that, unlike ancient Greek and Roman religions, Christianity had become far removed from the everyday frame of mind, something like a lifeless additional explanation imposed from the outside on the modern mind. It also alienated the human psyche from its pursuit of beauty, freedom, and happiness. A little later, he came to see religion mainly in terms of ethics (as Kant did), before concluding that the narrowly ethical stage was transcended by Jesus’ vision of love, thus restoring the alienated self of humankind. The succession of Hegel’s writings constitutes a consistent whole that can really be called a system, unlike the works of his predecessors Fichte and Schelling, whose ideas changed considerably over time. Hegel’s thought is post-Kantian in that it has its starting point in the thinking I but, like Fichte, Hegel rejects Kant’s notion of the unknowable thing-in-itself. For him, the development of a thought system like his own is precisely the embodiment of the thing-in-itself, which he calls Absolute Spirit. In his early work on the Difference between the Philosophical Systems of Fichte and Schelling he further sided with Schelling in rejecting Fichte’s exclusive emphasis on the Ego, agreeing with Schelling’s view that the Absolute had to include both the subject and the object. However, he strongly disagreed with Schelling’s views on the obscure nature of that Absolute and its inaccessibility to rational thought. Hegel’s system consists of three main parts: The Logic (ontology), which deals with the nature of the Absolute prior to the “creation” of the world; the Philosophy of Nature, which deals with the Absolute’s estrangement in the material world; and the Philosophy of the Spirit, which covers the return of the Absolute into itself through the human spirit. For Hegel, the Absolute, reality itself, is not something transcendent that cannot be known (as for Kant), nor is it something beyond conceptual formulation (as for Schelling). In Hegel’s own words, the real is rational and what is rational is real. In Hegel’s dialectic, the Absolute unfolds conceptually and historically according to purely logical laws. Logic forms its very substance. Hegel calls his method speculative. For Kant, speculation meant the attempt of reason to go beyond the realm of the senses into what is unknowable—an inevitable and understandable tendency, but one that could only lead to failure. For Hegel, the term is entirely positive, meaning the capacity of the mind to discover the hidden contradictions in thought as well as their resolution. History has been unkind towards what has generally been perceived as the excessive claims of Hegelian speculation and in current usage speculation is much closer to the meaning Kant gave it than to that of Hegel. In his best known and first important work, the Phenomenology of Spirit, Hegel leads the reader through a sort of propaedeutic or prolegomena—an introduction to what he considers the genuine philosophical approach, culminating in absolute knowledge. Hegel rejects Schelling’s mystical approach that leaves the Absolute in darkness “where all cows are black.” The Phenomenology of Spirit can also be considered as a history of consciousness, from the lowest to the highest stage. First, there is the stage of ordinary sense-certainty leading to the scientific approach; this is the level of consciousness. Second, there is the level of self-consciousness. At this stage, intersubjectivity (the recognition of one self by another) is seen as essential, which leads Hegel to historical considerations on social relations. Hegel makes his well-known statement about the “unhappy consciousness” (das unglückliche Bewusstsein), that of the human mind divided between the consciousness of its imperfect self and the projection of perfection into a transcendent Being (seen as typical of medieval Catholicism). The third and final stage is characterized by reason (Vernunft) as opposed to mere understanding (Verstand). This level is characterized by the realization of universal self-consciousness, which itself goes through many stages and sub-stages. Hegel’s Science of Logic can be seen as the timeless description of the functioning of the mind of God. It follows the same triadic patterns as the Phenomenology and predictably this pattern will also be found in all other writings, because for Hegel it is the structure of all being. Thus, what Hegel means by logic is very different from the conventional meaning of the term. It does not express the formal laws of thinking, such as the principles of identity and contradiction in a static manner, but intends to elucidate the unfolding of reality as thought. Hegel starts with “being,” which is naturally associated in people’s mind with the notion of fullness and completion, because content is automatically assumed under that name. Being in-itself, however, is totally empty, as it has no specification—it is just being. It thus easily turns into its opposite, “non-being” (for-itself or otherness), because both are identically empty. The contradiction between the two is thus only apparent and it can be transcended by reason (Vernunft), which realizes that both can be brought to a higher level encompassing them without contradiction. That higher level is becoming (in-and-for-itself) and it is reached through the process of sublation (Aufhebung), one of Hegel’s most ingenious discoveries. Aufhebung has the triple connotation of cancellation, keeping aside for later, and bringing to a higher level. Thus, through the dialectical movement, every negation is in turn negated and what seemed lost reappears on a higher level of manifestation, leading all the way up to the Absolute Idea. The work of speculative thought is thus to reveal the contradiction inherent in an apparently simple concept such as being and then to show how this contradiction can be sublated. By showing this to be the spontaneous process of manifestation of reality, Hegel actually rendered unnecessary any appeal to a higher force (a transcendent God) to explain creation. And by showing how in this process contradiction is overcome, he rendered unnecessary any separate explanation of evil. Hegel’s philosophy stands or falls with that claim. It is, in fact, far from clear how and why, for instance, being and non-being turn into becoming, other than that this movement is posited by Hegel, and the initial emptiness of being is a very debatable statement based on a purely intellectual vision of being. Even if one accepts being and non-being as Hegel sees them, the “fuel” or “engine” that makes them transcend each other in becoming amounts to a pure leap of faith, since non-being does not offer anything to being that is not already contained in it. In this sense, Hegel’s system could be called a form of panlogical mysticism or rationalized Romanticism, where Schelling’s mysterious Absolute is replaced by the equally mysterious laws of Absolute Thought. If the Logic deals with Spirit as it is in-itself, the Philosophy of Nature deals with the self-alienation of Spirit in the natural world before it returns into itself, which is the topic of the Philosophy of Spirit. The Philosophy of Nature is not meant to be a history of nature (Hegel dismisses the idea of evolution), but rather a presentation of the structure of nature according to the triadic pattern. This part of Hegel’s system is particularly controversial, as Hegel often tries to fit the reality of nature into his preconceived vision. Hegel also sometimes refers to nature as the realm of contingency, he speaks of the impotence of nature, and he even states that nature is a fall away from idea, which raises many questions about his overall perspective. Hegel's works have a reputation for their difficulty, and for the breadth of the topics they attempt to cover. Hegel introduced a system for understanding the history of philosophy and the world itself, often described as a “progression in which each successive movement emerges as a solution to the contradictions inherent in the preceding movement.” For example, the French Revolution for Hegel constitutes the introduction of real freedom into Western societies for the first time in recorded history. But precisely because of its absolute novelty, it is also absolutely radical: on the one hand the upsurge of violence required to carry out the revolution cannot cease to be itself, while on the other, it has already consumed its opponent. The revolution therefore has nowhere to turn but onto its own result: the hard-won freedom is consumed by a brutal Reign of Terror. History, however, progresses by learning from its mistakes: only after and precisely because of this experience can one posit the existence of a constitutional state of free citizens, embodying both the benevolent organizing power of rational government and the revolutionary ideals of freedom and equality. The Philosophy of Right is one of the most important parts of Hegel’s system. In the overall scheme, it represents the stage of the objective Spirit in Hegel’s Philosophy of Spirit, i.e., the second last stage of the whole edifice. It is the stage where the Spirit returns into itself at the level of institutions. The Philosophy of Right is dealt with in the Encyclopaedia of the Philosophical Sciences, but even more extensively in Hegel’s textbook on the Philosophy of Right, based on his public lectures. Since, for Hegel, it is the totality as the full manifestation of the Absolute that matters, it is normal that his ethics would be less limited to the individual’s consciousness than Kant’s categorical imperative. For Hegel, ethics and right culminate in the state as the concrete manifestation of the Spirit through human interaction. But first, on the level of law, Hegel deals with the notion of crime and punishment. Punishment is seen as the negation of the crime and Hegel even states that the criminal implicitly calls for his punishment as the logical outcome of his crime. This law is then internalized in conscience on the level of morality. Third, it is fully manifested at the successive levels of family, society, and state. Hegel’s statement that Prussia represents the ultimate fulfillment of world history and the perfect self-manifestation of the Absolute Spirit has often been ridiculed, and it indeed appears as a rather pathetic claim in hindsight. Also, Hegel’s emphasis on the state has a connotation on oppressiveness. However, at least on the level of his vision, it is perfectly natural that Hegel would see the embodiment of the Absolute in the whole, i.e., the state, as the culminating point, rather than any individual achievement. Also, though there was an overlap between his views and the immediate interests of the Prussian State of his time, Hegel was not really a conservative supporter of that state and his philosophy soon fell out of favor. In addition, Hegel did not really consider the Prussian State as the ultimate end of history, especially since the level of the state itself does not represent the culmination of his system. For Hegel, philosophy is the owl of Minerva, i.e., it reflects on the state of things it finds when it appears and it cannot not prophesize the future. For instance, for him, Plato’s Republic represents a reflection of the Greek political situation of that time, rather than an utopist vision. More problematic, though consistent with the whole system, is Hegel’s understanding of war as a necessity, as the process by which one state negates another to drive history forward. There, Hegel differs entirely from Kant, who was hoping for a world federation of States and perpetual peace. Hegel did see certain individuals as the carriers of the “world spirit” and he considered the German people to be the first to achieve the full awareness of the freedom of the human spirit. The Philosophy of Spirit properly closes Hegel’s system. In it, the “world spirit” is not seen as realized in a world state, but rather in the Absolute Spirit fully becoming himself in Absolute Thought, through art, religion, and philosophy. Based on the state as a precondition for their development, these three spheres represent three different formulations of the same content, that of the Absolute Spirit. Hegel introduces an elaborate overview of historical development in these areas. However, the difference between temporal sequence and timeless structure is not always obvious. Religion and philosophy, in particular, have the same object: to know God. If philosophy replaces analogy and historical sequences with logical structures and abstraction, it thus remains essentially religious in Hegel’s eyes. Hegel salutes the early attempt by Anselm of Canterbury to express religious faith in rational language. In his 1824 lectures, Hegel is credited with defining the field of philosophy of religion, though the philosophical study of religion as a modern discipline has become something quite different from what was really Hegel’s speculative philosophical theology. Hegel revisits the themes of Christian theology along the lines of his own vision. The proof of God’s existence, in his view, is provided by the system itself, which is the full manifestation of the Absolute and requires no further external evidence. As for religious consciousness, Hegel again sees it as developing in three stages: the simple consciousness of God as the infinite Being; the awareness of one’s self as sinner as opposed to God; and the sense of salvation and newly found communion through religious practice. Finally, there are three stages of historical development of religion: natural religion, where religious consciousness is undifferentiated; Jewish, Greek, and Roman religion, which is seen as the religion of individuality; and absolute religion, Christianity, where God is seen as both transcendent and immanent through the God-man, Christ, and the Trinity. Hegel’s identification of God as the Absolute is a key aspect of his philosophy. It is also one of the most ambiguous ones. In his philosophy of religion, for instance, Hegel specifically intends to explain the Christian themes in terms of his philosophical terminology and just simply in terms of his system. For the very reasons that have become apparent throughout this article, many have felt that Hegel’s Christian language in fact covers a line of thought far removed from, even opposed to, that of Christianity. Examples are the fact that God is seen as much as the end product of history as he is seen as its beginning, the fact that there is no clear difference between Creator and creation, and the fact that evil and sin are seen more as an inevitable transition towards ultimate completion than as an accident contrary to God’s original goal. The Hegelian system represents the culmination of the philosophical movement known as German Idealism, a movement essentially represented by Fichte, Schelling, and Hegel, but that also has ramifications beyond the strictly philosophical realm. German Idealism directly developed out of Kant’s critical philosophy. Kant had sought to put an end to what he called dogmatism by showing that the great metaphysical systems of the past were based on unwarranted assumptions (belief in God and the afterlife) and reached beyond the grasp of human reason. Kant’s conclusion that human consciousness was unable to reach metaphysical certainties on a theoretical level and was thus limited to the moral certainties of practical reason was immediately challenged by his successors, beginning with Fichte. What stayed, however, was Kant’s starting point in transcendental consciousness, i.e., the conclusion that all certain knowledge must be based on a function of our mind preceding experience. Unlike Kant, the German Idealists believed that through its own activity the human mind was indeed capable of reaching ultimate knowledge and it is on that foundation that they developed their systems. Though Hegel’s system is at least equal to any earlier metaphysical system in size, scope, and ambition, it thus has a very different starting point. Depending on one’s viewpoint, one can consider that his speculative system completes Kant’s system or that it rather repudiates its conclusions and reverts to the days of traditional metaphysics. Those who accept Hegel’s dialectics will consider his system as an innovative approach to the problem of agnosticism that had represented the limit of Kant’s investigations. By showing the actual unfolding of the Absolute, Hegel removed any need to posit a transcendent “thing in itself” and thus eliminated the last remnants of dogmatism in Kant’s philosophy. On the other hand, many will see Hegel’s system as the apex of philosophical hubris, i.e., a mistaken attempt to achieve through mere speculation what revelation and tradition had been unable to complete. For them, by proceeding as he did, Hegel ignored Kant’s justified caveat and undid what he had accomplished. In either case, Hegel’s system undeniably represents the most complete of the three philosophies that make up German Idealism. If Fichte’s system can be referred to as subjective idealism due to his focus on the Ego, and Schelling’s system as objective idealism because he posits an Absolute as independent from the Ego, Hegel’s system embodies the views of Absolute idealism, i.e., the belief that the underlying reality of the cosmos is an absolute Spirit that transcends any individual spirit. One important question concerning Hegel is the extent to which his philosophy is conflict-oriented. In popularized accounts, Hegel's dialectic often appears broken up for convenience into three moments called "thesis" (in the French historical example, the revolution), "antithesis" (the terror which followed), and "synthesis" (the constitutional state of free citizens). In fact, Hegel used this classification only once, when discussing Kant; it was developed earlier by Fichte in his loosely analogous account of the relation between the individual subject and the world. Heinrich Moritz Chalybäus, a Hegelian apologist, introduced this terminology to describe Hegel’s system in 1837. More importantly, Marx and Engels applied these expressions to their dialectial materialism, thus using their potential towards a conflict-oriented explanation of history. There is no question that Hegel’s philosophy was, so to speak, highjacked by Marx, who admittedly used it in a sense that was diametrically opposed to that of Hegel. It is nevertheless significant that Hegel’s method had dialectical materialism as its historically most significant result. This is clearly due to its core constituent, the dialectical movement, meant to explain progress and fulfillment as the overcoming of an inherently conflictual nature of reality. Still, for Hegel, reason is ultimately "speculative," not "dialectical." Instead of thesis-antithesis-synthesis, Hegel used different terms to speak about triads, including immediate-mediate-concrete as well as abstract-negative-concrete, but Hegel's works do speak frequently about a synthetic logic. Hegel's philosophy is not intended to be easy reading because it is technical writing. Hegel presumed his readers would be well-versed in Western philosophy, up to and including Descartes, Spinoza, Hume, Kant, Fichte, and Schelling. Without this background, Hegel is practically impossible to read. Ironically, Hegel has managed to be both one of the most influential thinkers in modern philosophy while simultaneously being one of the most inaccessible. Because of this, Hegel's ultimate legacy will be debated for a very long time. He has been such a formative influence on such a wide range of thinkers that one can give him credit or assign him blame for almost any position. The height of audacity in serving up pure nonsense, in stringing together senseless and extravagant mazes of words, such as had been only previously known in madhouses, was finally reached in Hegel, and became the instrument of the most barefaced, general mystification that has ever taken place, with a result which will appear fabulous to posterity, as a monument to German stupidity. Many other newer philosophers who prefer to follow the tradition of British Philosophy have made similar statements. But even in Britain, Hegel exercised a major influence on the philosophical school called "British Idealism," which included Francis Herbert Bradley and philosopher Bernard Bosanquet, in England, and Josiah Royce at Harvard. Historians have spoken of Hegel's influence as represented by two opposing camps. The Right Hegelians, the direct disciples of Hegel at the Friedrich-Wilhelms-Universität (now known as the Humboldt University of Berlin), advocated evangelical orthodoxy and the political conservatism of the post-Napoleon Restoration period. The Left Hegelians, also known as the Young Hegelians, interpreted Hegel in a revolutionary sense, leading to an advocation of atheism in religion and liberal democracy in politics. Thinkers and writers traditionally associated with the Young Hegelians include Bruno Bauer, Arnold Ruge, David Friedrich Strauss, Ludwig Feuerbach, Max Stirner, and most famously, the younger Karl Marx and Friedrich Engels—all of whom knew and were familiar with the writings of each other. A group of the Young Hegelians known as Die Freien ("The Free") gathered frequently for debate in Hippel's Weinstube (a winebar) in Friedrichsstrasse, Berlin in the 1830s and 1840s. In this environment, some of the most influential thinking of the last 160 years was nurtured—the radical critique and fierce debates of the Young Hegelians inspired and shaped influential ideas of atheism, humanism, communism, anarchism, and egoism. Except for Marx and Marxists, almost none of the so-called "Left Hegelians" actually described themselves as followers of Hegel, and several of them openly repudiated or insulted the legacy of Hegel's philosophy. Even Marx stated that to make Hegel's philosophy useful for his purposes, he had to "turn Hegel upside down." Nevertheless, this historical category is often deemed useful in modern academic philosophy. The critiques of Hegel offered from the "Left Hegelians" led the line of Hegel's thinking into radically new directions—and form an important part of the literature on and about Hegel. In the latter half of the twentieth century, Hegel's philosophy underwent a major renaissance. This was due partly to the rediscovery and reevaluation of him as a possible philosophical progenitor of Marxism by philosophically oriented Marxists, partly through a resurgence of the historical perspective that Hegel brought to everything, and partly through increasing recognition of the importance of his dialectical method. The book that did the most to reintroduce Hegel into the Marxist canon was perhaps Georg Lukacs's History and Class Consciousness. This sparked a renewed interest in Hegel, reflected in the work of Herbert Marcuse, Theodor Adorno, Ernst Bloch, Raya Dunayevskaya, Alexandre Kojève, and Gotthard Günther, among others. The Hegel renaissance also highlighted the significance of Hegel's early works, i.e., those published prior to the Phenomenology of Spirit. More recently two prominent American philosophers, John McDowell and Robert Brandom (sometimes, half-seriously referred to as the Pittsburgh Hegelians), have exhibited a marked Hegelian influence. Beginning in the 1960s, Anglo-American Hegel scholarship has attempted to challenge the traditional interpretation of Hegel as offering a metaphysical system. This view, often referred to as the “non-metaphysical option,” has had a decided influence on most major English language studies of Hegel in the past 40 years. The works of U.S. neoconservative Francis Fukuyama's controversial book The End of History and the Last Man was heavily influenced by a famous Hegel interpreter from the Marxist school, Alexandre Kojève. Among modern scientists, the physicist David Bohm, the mathematician William Lawvere, the logician Kurt Godel, and the biologist Ernst Mayr have been deeply interested in or influenced by Hegel's philosophical work. The contemporary theologian Hans Küng has advanced contemporary scholarship in Hegel studies. The very latest scholarship in Hegel studies reveals many sides of Hegel that were not typically seen in the West before 1990. For example, the essence of Hegel's philosophy is the idea of freedom. With the idea of freedom, Hegel attempts to explain world history, fine art, political science, the free thinking that is science, the attainments of spirituality, and the resolution to problems of metaphysics. One appropriate way to assess Hegel's work would be to understand it in the historical context of his days. During his formative 10 years (1788-1799) as a young theologian, he was faced with the diversity of conflicting schools of religion: institutional Christianity, Pietism, Enlightenment religion, Romanticism, and Kantianism. This diversity, in fact, started with the collapse of the Medieval synthesis into the Renaissance and the Protestant Reformation 300 years before Hegel and still continued to exist with even more variety in his days. Thinkers such as Kant and Schleiermacher attempted to come up a synthesis. So did Hegel. His formative years as a theologian ended with a new understanding of Jesus' vision of love beyond the tension between Kantianism (Judaism) and Romanticism (Hellenism), as can be seen in his The Spirit of Christianity and its Fate written in 1798-1799. Here, we can trace Hegel's concern to dialectically reconcile the opposites of experience into a higher unity. Needless to say, this was far more developed later as a new form of logic in his philosophical writings, where he reached what Paul Tillich calls his "universal synthesis," going beyond all kinds of opposites. It is probably useful to appreciate Hegel's attempt to come up with unity beyond fragmentation and alienation, given the historical diversity of schools at that time, although whether his attempt was successful or not is another matter. Given the fact that his absolute idealism, with God and the world, or spirit and matter, respectively as subject and object to be united by rational necessity, was split into Right and Left Hegelianism, his universal synthesis proved to be far from successful. Ludwig Feuerbach among other Left Hegelians deliberately turned Hegel's absolute idealism upside down, reversing Hegel's subject-object order, and to this Marx added the conflict-orientation of the Hegelian dialectic and came up with dialectical materialism and historical materialism. By contrast, Right Hegelianism faded away; after less than a generation, Hegel's philosophy was suppressed and even banned by the Prussian right-wing, thus having no influence on the nationalist movement in Germany. But, on the right side, there emerged another school of religion, which had a lasting influence beyond the nineteenth century. It was the existentialism of Danish philosopher Soren Kierkegaard, a contemporary of Feuerbach, and as a reaction against Hegel's system, it was tied with individual faith and asserted that truth is subjectivity. According to Tillich, therefore, Hegel's universal synthesis "broke down" into Feuerbach's atheistic anthropology and Kierkegaard's God-centered existentialism. Many consider Hegel's thought to represent the summit of early nineteenth-century Germany's movement of philosophical idealism. But all those who received a profound influence from it in the nineteenth century opposed it. Even modern analytic and positivistic philosophers have considered Hegel a principal target because of what they consider the obscurantism of his philosophy. Perhaps this basic rejection of Hegelianism will continue until a satisfactory path for a synthesis is found, realizing Hegel's dream. Is the contemporary renaissance of Hegelian studies interested in pursuing it? "The true is the whole." (Das Wahre ist das Ganze. )—The Phenomenology of Spirit, section 20. Harris, H.S. Hegel: Phenomenology and System. Indianapolis: Hackett, 1995. Marcuse, Herbert. Reason and Revolution: Hegel and the Rise of Social Theory. London, 1941. History of "Georg Wilhelm Friedrich Hegel"